The mobile screen for business or home. Electrical up and down movement. Created with the lower part fixed and a motorized mobile glass panel. A versatile barrier enabling contemplation of the outside panorama. 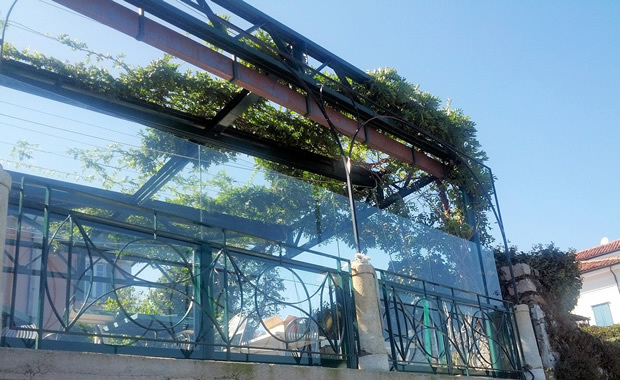 Created to protect the outdoor areas of bars, restaurants and hotels (horeca), which want to make use of arcades, terraces and other open spaces all year round. It creates a transparent barrier, which disappears when fine weather arrives. 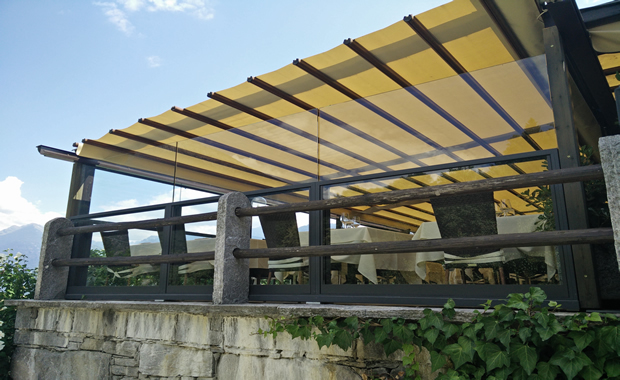 It is the perfect glass wind break for seaside areas that are often subject to strong winds, so that tables in the open air can be delimited and protected. Ideal also in order to shelter private houses’ outdoor areas from cold air and wind: terraces, verandas, balconies, arcades, gazebos, swimming pools and gardens. 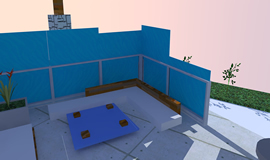 Protection and/or privacy, for example, by swimming pools or solarium. Suitable for Horeca or Home. Designed to protect tables placed outdoors in public spaces, Bellavista System has a clamp fastening system allowing easy and speedy removal when required. The mobile screen, known also as a wind break, has been designed and built to measure with selected and tested materials in their systems, all to the benefit of their quality and functionality. Made to measure according to customer requirements. All Glass: there are no vertical struts between mobile panels. Mobile panels are in glass that is tempered or laminated up to 10 mm, with polished edges. The lower part is in transparent or opaque glass up to 10 mm thick, or with a blank wall. Fixed modules can be made with the same aesthetics. The lower panel can be painted or covered as if it were a wall. The mobile panel can be blocked in any position. Single electricity connection, there is an electrical feedthrough in each module. The clamps make it easy to put the panels in line, overcoming the problem of slopes. Where necessary, a lower frame can be used, which creates a level where flooring can be installed from the outside. The fast and safe electrical system for opening and closing makes it possible to protect the environment and obtain localized shelter in just a few seconds. The electrical movement is operated by a special remote control or live-man switch wall (according to the model or use). The panels can be moved individually or in groups. The power provided is 220V. Movement must be carried out under supervision. ** It is possible to build higher with higher lower frame. 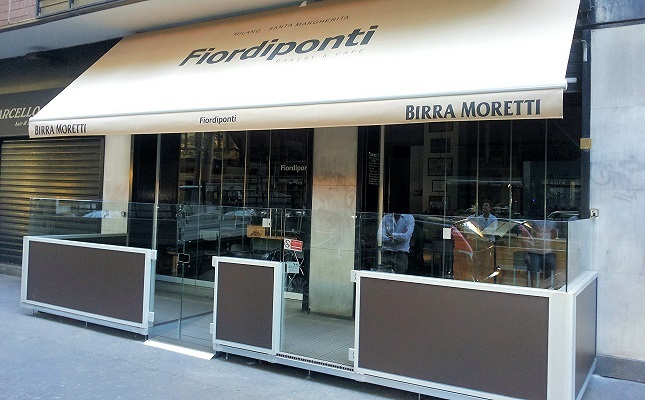 The video shows the opening and closing of the glass BellaVista System screen made with blank lower panels for a well-known Milanese bar. Thanks to the absence of frame between the moving glass, BellaVista System creates an all-glass effect and you can enjoy the angle free from obstruction. The panels in glass are only 4 mm away from each other. 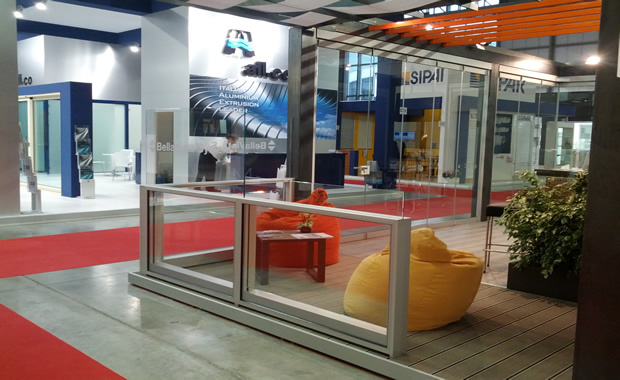 There is the option to install seals in transparent polycarbonate, specifically researched by GM Morando. These seals for use in periods of residence are fitted between the two glass panels, closing out draughts and providing even greater protection to the environment. This possibility is particularly appreciated by business owners with open spaces that, during the winter months, can have a complete glass barrier. It is possible to personalize the BellaVista System both from the functional point of view, selecting the geometry and the measurements, and also from the aesthetic point of view, tilted parts in aluminium and glass in an infinite range of finishings (for the aluminium: including anodised, painted or wood effect; for the glass, including transparent to extra light or etched or even having personalized decorations). To evaluate a product properly it’s imperative to see it in action. In the photo gallery you can see the reality that BELLAVISTA SYSTEM creates with your own eyes. ©2009 GM Morando srl - PI 0401 7290968 - BellaVista System is a trademark registered by GM Morando Srl. - All rights reserved.